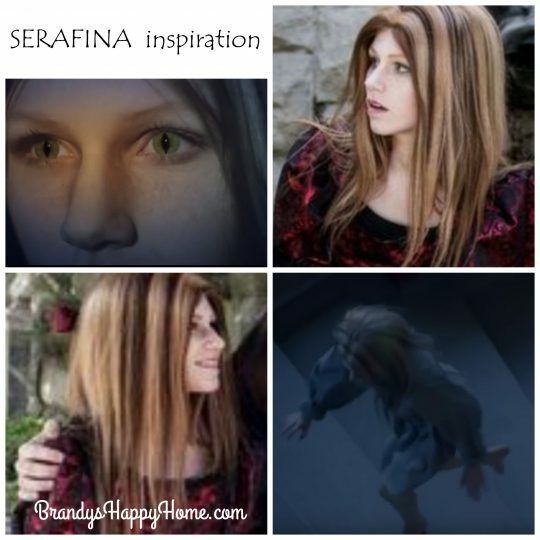 On page 13 of the book, Serafina’s hair is described as: “Her long hair wasn’t a single color like normal people had, but varying shades of gold and light brown. Her face had peculiar angularity of the cheeks.” In the synopsis of the book trailer is goes on to describe Serafina’s hair as: “a mane of streaked, lion-like hair.” I knew immediately that I wanted to use an American Girl doll Marie Grace face mold for this custom doll. The particular face mold had the narrowed cheek/chin line that I wanted. I was able to find a used doll in excellent condition at a very good price. My next step was to hunt down the wig. I was able to find a perfect wig from Britlyn Madison. This particular wig is called “Caramel Macchiato.” It had the perfect combination of golden browns and champagne blonde; this is just what we imagined Serafina’s ‘lion-like mane’ to look like. Working with Britlyn Madison was wonderful. They custom cut the wig to my specific request…the cut was free with purchase. 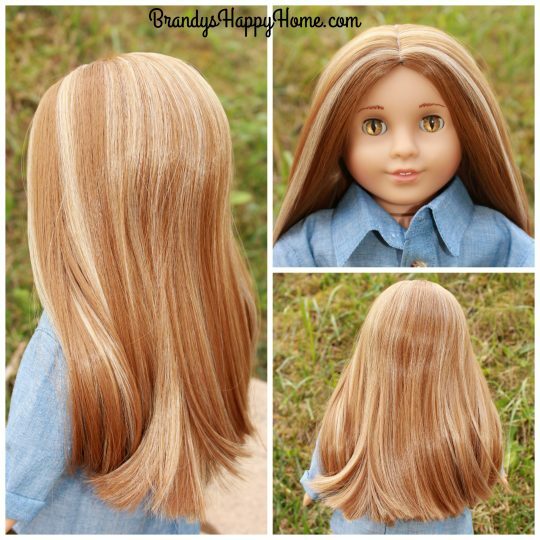 This is a high quality doll wig; it is silky and thick and easily styled. I look forward to buying from Britlyn Madison again! You can find this particular wig here: https://www.britlynmadison.com/shop/caramel-macchiato-extra-long-doll-wig-size-10-11-for-american-girl-dolls/ . You can also find them on Facebook here: https://www.facebook.com/Britlyn-Madison-Doll-Clothes-138621039549103/?fref=ts . And now for Serafina’s FABULOUS eyes! On page 13 of the book, Serafina’s eyes are described as “large, steady amber eyes. She could see at night as well as she could during the day.” Once again the book trailer was viewed for images of the character’s eyes as well as our own impression of what the eyes would look like. Honestly if I hadn’t found Michelle from Custom Eyes by Michelle, I’m not sure I would have even created this doll. My daughters and I felt the eyes were a key character feature. Michelle was able to capture exactly what we had envisioned for Serafina’s eyes. 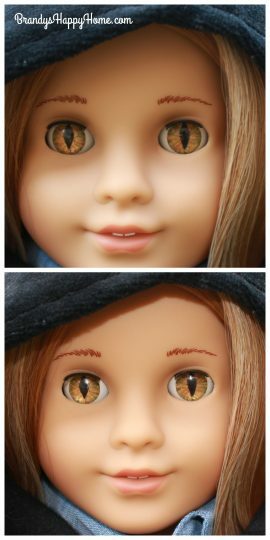 They had that beautiful amber color with just a slight tint of green on the outside and the perfect cat-like pupil. We are in LOVE with these eyes. You can find Michelle here: https://www.etsy.com/shop/CustomEyesByMichelle . You can find Michelle on Facebook here: https://www.facebook.com/MichellesCustomEyes/about/?entry_point=page_nav_about_item&tab=page_info. The top picture is without a flash and the bottom with flash; I did this to show you all of the dimensions of the eye color. “Serafina didn’t own a dress, so she wore one of her pa’s old work shirts, which she cinched around her narrow waist with a length of fibrous twine she’d scavenged from the workshop.” This description came from page 13 of the book. Once again, Serafina’s PA Shirt Dress came from the combination of the book trailer and our vision. I knew immediately I had to go to Carol of Sew Sew Carol to create this custom dress. Carol never disappoints! 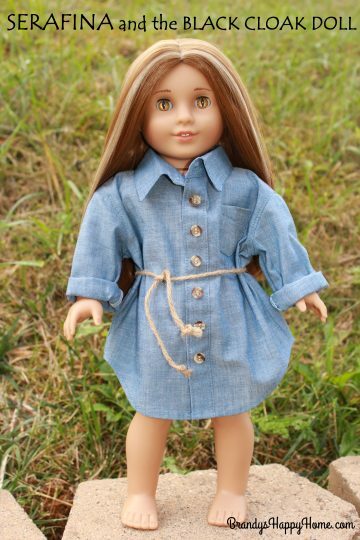 Carol has created numerous custom doll clothes for me. She is a fabulous seamstress and she created exactly what we had envisioned. This dress is an oversized shirt in a grey-blue material. You can contact Carol at her Etsy shop for custom requests here: https://www.etsy.com/shop/SewSewCarol?ref=pr_faveshops . Fingers crossed that Miss Carol makes the red dress that Serafina wears sometime in the future! Of course Serafina had to have a black cloak! We have had the cloak for several years. 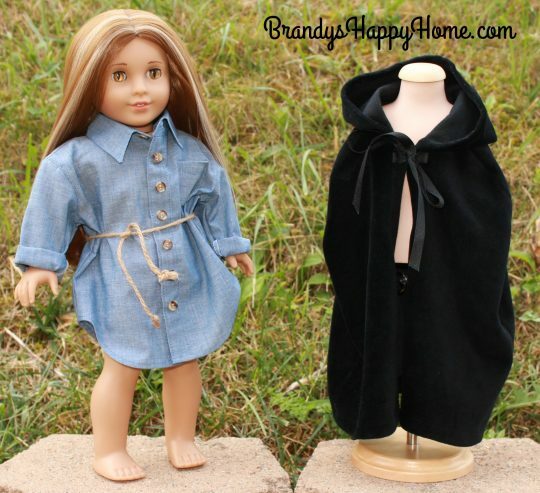 This cloak was originally for a custom Princess Merida doll. 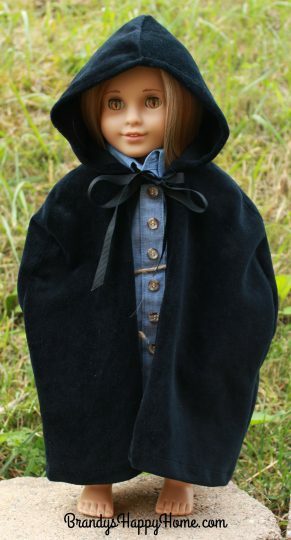 Here is a picture of Serafina in the black cloak. Photo is taken without flash for a more mysterious look. 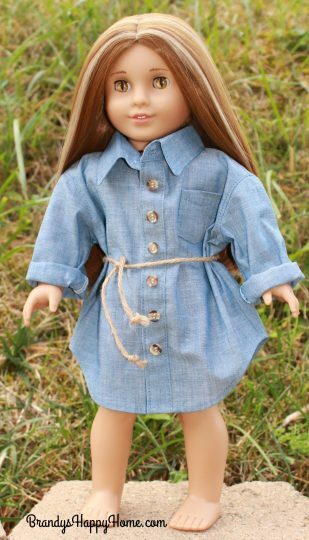 We love how the Serafina doll turned out! These pictures taken on a retaining wall in our backyard reminded us of Serafina prowling the grounds of the Biltmore. Come back next week to see how this Serafina doll transforms into Serafina and the Twisted Staff. This doll is so beautiful! It represents Serafina wonderfully. Her eyes and hair seem so accurate compared to the description in the book. Being a fan of the book myself, I absolutely love the doll. Fantastic job! Thanks Lily! A lot of time went into researching exactly how we envisioned this doll. We are thrilled too! Hi Ginnie! I believe the book is rated for 5th grade and up. We read the first book as a family ready at bedtime, (my youngest is 8y.o and did fine with it) where we each take a turn reading a few pages. Thanks Marilyn! We love Serafina! This is so cool! And thank you for the links to places you got the wigs and eyes, that information is always handy to have. A-mazing! I knew this would be well done, but you have exceeded all expectations, Brandy! I think the Beatty family would be pleased with this, too! Looking forward to the NEXT blog! Thanks Carol! We are so excited to share our version of Serafina and the Twisted Staff next week! Great job at making her story book come to life. Thanks Linda! We love Serafina! You just made a wonderful work as always!! !